What to do when your monkey gets out of it’s cage at home? Pray that all doors and windows are locked and that Tiki is not at your house visiting! Pray that there is nothing on the stove hot. Pray that you will be home soon. Pray that none of the neighbors come walking in to visit. Pray that the monkey does not put something in the toilet and then flushes it. Pray that the monkey does not wish to shave with a Bic shaver. Pray that the monkey does not wish to write with a Bic pen too! Pray that the monkey does not decide to cook spaghetti in the microwave and mixes it up on the kitchen floor. Pray that the monkey does not wish to put on make-up and eat it and then put it all over their face and hands and go running through your house which just happens to have light beige colored carpet in it. Pray that the monkey does not wish to go and unlock the other monkey’s cages after it has just picked the lock of it’s own cage with a staple from one of the section of the Sunday newspaper. Pray that you have time to examine your head about getting a monkey to begin with! Yes, these things and more have happened since I have had monkeys in my home. I have seen everyone of these messy things happen and have also had to clean them up! The reason that I started tonight to write this post is because of the following story. Hope you get a laugh out of it. My friend Lisa called me to tell me that the weather was going to change and become bitter cold for the next several days. With this in mind, I decided to move the monkeys from the monkey room and into the kitchen, so that I could begin with the cleaning out of the monkey room. I was so glad that I took her advise because the weather did in fact change very quickly. It was unbelievable how the monks were talking and greeting each other as they were being put into the kitchen. Their calls and screams were totally unexpected behavior for me but I then started to think about how long it had been since some of them had seen each other. One would make the call and start screaming and then the next two would scream over and over again. I can say this was the first time I have ever experienced this type of greeting between the monkey. This went on for three days and two nights. I really do not think they slept at all during this time when the screams going on (but maybe by taking a nap here and there). My husband, Bob was equally concerned especially on Tuesday night, when his book study group came for the evening. He was so afraid that the monkeys would not be quiet enough so that the group could talk or even be able to hear him over the screams of the monkeys So, Lisa and I decided to feed them early and cover their cages up with blankets and turned off all of the lights in the kitchen and then we went out for a couple of hours while Bob had his book study. Bob called on my cell phone after his group was over, to tell us that we had accomplished a very good thing by covering up the monks and turning off the lights. He told me that the monks had not bothered them much at all. So, we were all happy that the monks had chosen to finally settle down for a few hours. When we arrived home it all started again. That loud screaming was so hard to take. It was mostly between the six, black/caped Capuchin monkeys but when they would start all of the other monks would start streaming and making their own sounds too. I promise you this was something that I will never forget ever! It took me awhile to figured out what was going on with my troop of monks but it eventually started to make since as the mystery started to unfold. 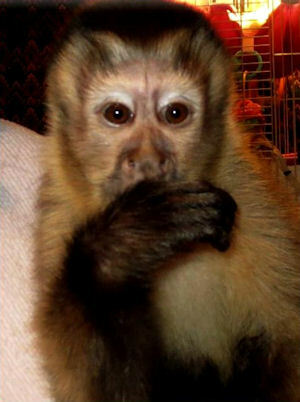 Maggie Mae who is my (22 year old black/caped – alpha) monkey had been in the kitchen cages due to a problem that she was having with her tail for several weeks. So, Opielocka my (black-caped female 9 years old) had been in the monkey room with Pincher and Mic-Mic who are the oldest male monkeys. She had been trying to win them over to her side so that she could take over the troop from Maggie Mae ever since she had come to SunShine MonkeyShines, three years earlier. 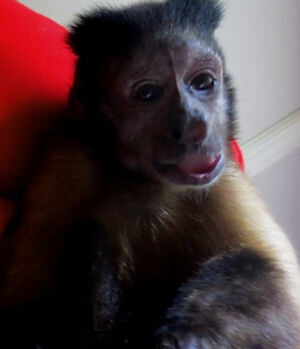 Mic-Mic (black-caped Capuchin around 25 or so) came to live full time with me in August of 2014 so, there has been a blossoming love affair going on between Maggie Mae and Mic-Mic for around 6 months now. Maggie Mae had been out of the monkey room of course for a pretty good period of time so I could keep watch over her tail and evidently Opielocka had been working really hard on the two older male monks as she had been trying to win their hearts. When I brought the full troop together in the kitchen, I did not remember that is was full moon time and that the females would be in their famous monthly “Hummie Time” either. This fact I had not even though about until little Pixie started to display her little “Hummie Time” sounds and movements. So, here we are, all gathered together in the kitchen with many things going on at one time and it is “Hummie Time” on top of everything else! Suddenly, a light bulb went off in my head. Mic-Mic was calling for Maggie Mae and Opie was calling for Mic-Mic and Maggie was just being quiet. Pincher (my 25year old black/caped) and Pixie (4 ½ year old Black/caped) were joining in just to be doing it to add to it all. This is when I realized that I needed to put Mic-Mic with Maggie Mae. Bright ideas, I thought to myself. 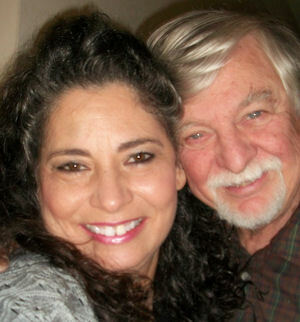 I wish I had turned on the tape recorder when I put the two obvious sweethearts together. Well it turned out to fix everything very quickly. I was so glad that I had finally at least figured out what was happening to my monkeys!!! Opie was trying to get Mic-Mic to side with her and she was the one starting all of the screaming to try to keep the troop upset as she was asking Mic-Mic to join with her and call first after her scream. Yes, that little stinker Opielocka thought since Maggie Mae had not been in the monkey room that she had the two boys on her side (Mic-Mic and Pincher) and she would be the alpha of troop. The moment that I put Mic-Mic in with Maggie Mae it was calm city for sure. Thank you, God, for helping me understand why this screaming was happening with my troop of monkeys. Bless my little girls heart though. Opielocka is very normal again as she is just waiting for another opportunity to steal Maggie Mae’s boyfriend away. Oh, I did forget to tell you about a special thing about their reunion. They were so excited to finally get together after their time apart that they rocked and screamed for a long time before they began to settle down. I think they wanted to let Opielocka, and the rest of the troop know loud and clear that they were a matched pair and that meant that Opie was not taking the troop away from Maggie Mae. Mic-Mic and Che-Che came to me this past summer. 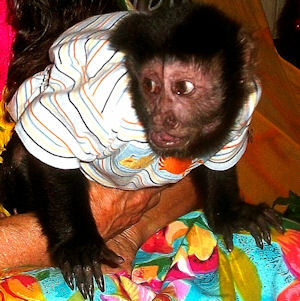 Che-Che is somewhere around 38 + and is what I call a Paraguayan (or the slang word is Weeper Capuchin.) She is almost blind and is a very large monkey. She is by far the largest monkey in my troop. There is not one questions in my troop’s mind or mine that she was the alpha of her troop in years past. During this evening, I had been busy texting and messaging back and forth with several friends and enjoying being able to hear myself think with all of the monks finally getting settled into being in the kitchen together. I chose to spend the day cleaning the monks kitchen cages and doing up the blankets for the monks instead of working on the monkey room since everything had settled down with them. My mind went instantly to the time earlier in the day when my friend Margie had been here and when she had left, which was around 4:00pm. I remembered that was when I had opened Che-Che’s cage up for Margie to meet her just before she had left. I thought to myself maybe she had escaped out of the house at that time. She was not making a sound. She was not anywhere in the house or Bob and I both surely would have heard her. She is blind, I thought to myself. Where would she go in the house? She is blind! I thought, what if she did get out the door when Margie left? My mind was growing things and those things were growing bigger and they they had already jumping to huge terrible thoughts. Everything that I have been writing in the postings of the “Safety First” topic, just went out of my mind. I was not being POSITIVE!!!!! So, now you know why I am laughing at myself and chose to write this post at this time! Monkeys can do so many destructive things, when they get out of their cages. I can say that it is not an everyday occurrence at my house, thank you God ! I do know without a doubt that it is always very interesting when it does happen. Bob and I are what I call “Johnny On The Sport.” We are a team when it comes to finding the monkey escapee in the house. Now, let’s go to the second list that could save your monkey’s life. It is very important for you to make sure your doors are locked when you first notice that you have a monkey out of it’s cage. When you first open a door and look into the room and see that things are messed up really bad, you have a really great idea that the monkey is out. LOL So, please choose to very quickly close the door and lock it behind you. “Safety First” type of procedures should already be into play such as medicine’s placed properly in a safe place away from the monkeys and things that you know could hurt them terribly badly like: potato peeler, extremely sharp knives, poisons such as cleaners, unsafe cosmetic items, razors, the list could go on and on. Most people usually realize from the very beginning that they need to monkey proof their homes. I usually start calling the name of the monkey that is lost and alert other members of the household that a monkey is out of it’s cage. I usually do not panic – Honest – really you must believe me!!!! I have found out that the calmer I am the better things go with getting them to show themselves and let me know where the search should start. I will say, “Where is my monkey?” Where is my Maggie Mae or Pincher or the name of which one is out of their cage? 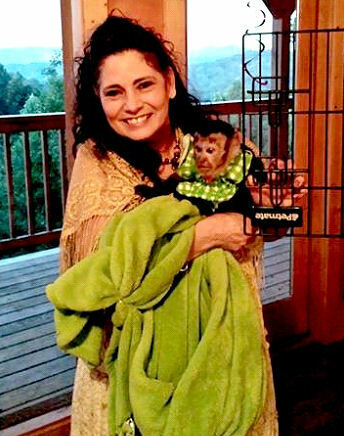 Many times it can be helpful when you are trying to get your monkey back in your arms to choose to bring another animal who they like being around into the search. I learned the hard way, if they choose to run from you and feel your upset over them being out, this is when they will go and hide. Hiding is not what any monkey caregiver wishes to have happen in your home. I can truly say I have only had this happen two times and that has just been in the last year. Can you believe this? I, of course, have my theory about why this happened and both times I can say truthfully that I lost my cool and calm. I also can say that both times I had monkeys hide from me, I had to be somewhere which put me under pressure and extreme stress. So, by my mistakes I can help you learn not to do the same thing. I have always been able to get my monks back rather quickly and without lots of trouble because I train them so that they understand that they will get a treat if they are good monkeys and come to me within a short period of time – usually within three calls (of course this is when I see them escape it may take a few more calls when I find them out of the cage). 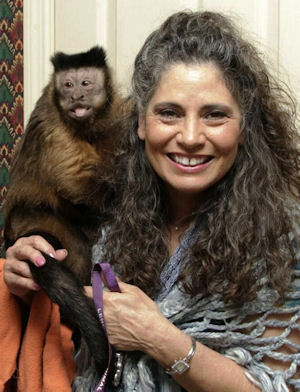 It is a little harder to get a monkey to give you their hand or come to you, when they have been out for awhile and have done naughty things to your home. If you can keep your cool as you are seeing the destruction of many of your prized possessions or you see shoo-shoo on top of many of your Christmas gifts, then it will be easier to get the monkey back into your arms. Every time I loose my composure and fake my voice to sound loving and gently, those little stinkers know it and it causes me lots more headaches. Now that I know and understand that they can hide on me and turn my search into a long and drawn out process. The message to myself is: Try to remain calm and remember the most important thing is getting your monkey safely back into your arms. When they make themselves known to you, this should take the pressure off of your search. The two times in this last year when the two monkeys went and hid from me, I was in such a hurry to get on my way. Getting off on time was more important to me than getting my monkey back into my arms. I found the consequences to be totally unacceptable! I never wish for one of my monkeys to ever hide from me. Now I know what an incredible feeling when they do that. A mixture of really big thoughts like: I am always giving you treats for coming to me, I am never ugly and beating you after you are loose in the house, I am always gentle to you, I have always been your favorite person, I have always been fair to you, and of course the biggie, why are you doing this to me???? I believe in rewarding them for coming to me rather quickly. When they are running around the house they know that I will call them two times to come to me and if I go to the third time, I am going to change the tone of my voice and 9 times out of 10 they will choose to come right to me. This is out of the programming that I gave to them when they first came to me. 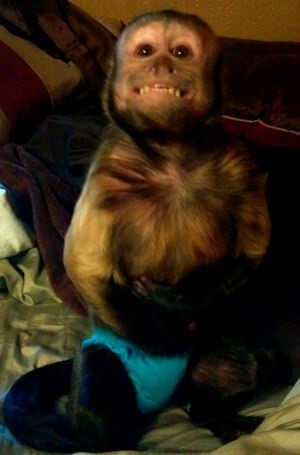 I choose to still believe that if you give your monkey too much freedom too soon (before they are mature enough emotionally) to deal with the freedom, that there will be problems such as getting them to come to you, when you call them and many other things. 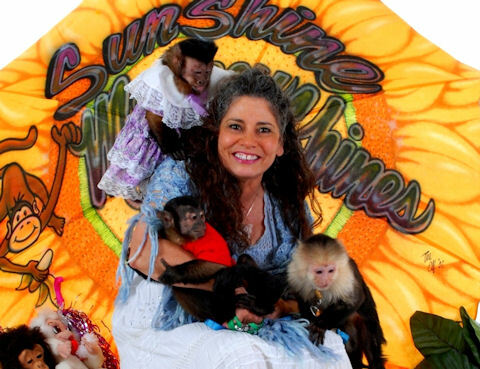 Watch the wild monkey presentations on TV. Do you see the mothers turn loose of their young monkeys and let them run in the rainforest? Sometimes it takes two or three mothers to watch after the very active monks in order to keep them safe and within their safe boundaries. Important Information: if I have a monkey that is running around my house and it is staring to do something dangerous or give them a possible injury or some other type of emergency situation, I have a very important tool that I have programmed my monks to understand. THE DANGER ACTION This is what I call the programming that I use when I see something that needs immediate attention. I clap my hands two times very loud and quick, while I say one word NO – this is the only time I will say the word NO all by itself. My one word NO is Loud – very Loud, as I clap my hands loudly two times. It startles them instantly and they know they have something that they are not suppose to have or they are going to do something that is not safe for them to do. They will instantly come to me after this is done. This programming is only acted upon in extreme situations. If I were to use this every time they got off their leads or out of their cages, it would no longer be the “Big One” to them. I need a “Big One” in my “Safety First” plans and programming. Programming is such an important thing to think about when you first get a monkey. I hope you will consider getting your down-loadable copy of “Living With Monkeys” to learn more about good programming skills. This book is not just for beginners, it is also a great help to many monkey caregiver who are trying to understand why their monkeys are acting and choosing to do certain things in their homes. I believe all monkeys know that they are not suppose to be out of their cage when they choose to get out. If you have established the proper role of alpha with your monkey then they will understand when you count to two that if they do not give you their hand that you will be upset. Monkeys do not like for the alpha to get upset in a real monkey troop or in their troop of human-family either. It is fun to laugh and even for me to make a few jokes along the way but every time a monkey gets loose without permission it is always something that needs to be taken care of quickly, calmly, and successfully. Hope this information will be helpful and that you will choose to program your escape artist in a positive way to come to you when they are out of their cage or off of their leads while at home. P.S. Hiding Monkeys I have never added a PS to a posting but this is important information to know about, when a monkey chooses to hide. When this situation does happen to you, it is time for you to just stop. Choose to go and sit in your favorite chair or place on the couch and calm yourself down. You can do this because the monkey has not escaped your home because you already know the doors are all locked. You can relax also because they are understanding that the focus is off of them and that makes them (for some reason) wish to come out to see what is going on with you. Think of anything but them. They read our mind pictures and as soon as you stop sending them mind pictures of them hiding from you something will change within them. Relax and cool down and they will be back in your arms much faster.